Why does my system run very slow? We could reproduce the described behavior. This is occurring because of a current Windows Update. … and goes on to specify the Win10 version 1809 cumulative update KB 4493509, and the Win7 updates KB 4493472 (April Monthly Rollup) and KB 4493448 (Security-only) can lead to the slowdowns. As was the case with the first mea culpa from Sophos, I have to wonder if that’s the full list of bad patches. I also wonder why Avira’s reporting a slowdown, whereas Sophos and Avast report freezes on startup. There are no other details I can find. Microsoft certainly hasn’t acknowledged anything other than a slight misunderstanding with Sophos. C’mon, Softies. You say you’re going to give us better accountability for patches and improved guidance when things turn for the worse. We could use a big dose of that right now. The next time somebody tells you that you have to install Microsoft patches as soon as they’re available… oh, nevermind. I guess it’s good that some folks volunteer to test this stuff. Good synopsis from Lawrence Abrams on BleepingComputer. rc primak 2 days, 10 hours ago. Who tests this stuff, anyway?? Let me guess. The fix will be in the previews coming in two weeks? Unfortunately, not everyone knows about Woody’s and reads what is advised regularly here. Those of us who do, should know better than to install patches right away. Or to install them sooner than weeks after Patch Tuesday, except in some exceptional emergencies. Unless one’s job makes it mandatory to patch everything right away, no matter what. Which, at this point, would seem like a good reason to start discreetly looking for another job. My question is what is Microsoft doing that is now triggering issues with anti-virus products? Closing some of the holes & hooks that antivirus authors used to enable their products to see what they need to see. Malware authors are using the same vulnerabilities to ply their trade. It all comes back to using undocumented APIs and inside the kernel drivers. These practices were bound to come back and bit end users in their backsides from the moment some vendors decided not to pay Microsoft for signed access inside the Windows (that the time Vista) 64-bit kernel. Never blame on malice (Microsoft Updates) what can be explained by stupidity (the third party AV vendors and developers). BTW, the main reason Windows Defender’s Protected Folders (anti-ransomware) feature must be turned off when you install and use third party security software is these same undocumented “back-doors”. And some Windows security Updates don’t properly install even though they are listed in your Updates History as “Successfully Installed” when these undocumented “back-doors” are present and active. I’m not just talking about Feature Updates. My advice is, if you are on at least Windows 10 Version 1709, ditch all active third party security products and use the Windows 10 Firewall, the Protected Folders feature and Windows Defender. And stop blaming Microsoft for things which are not within Microsoft’s power to anticipate. I can’t speak for Susan but I know she’s been in favor of that position as well. (Just using w10 Defender) I have to admit I haven’t seen Microsoft so dedicated to AV protection since MS-DOS. I wonder why that is?….. Probably want you to use MSE or Defender instead. ‘Can of worms’ and I don’t envy the the task, especially when attributes affect third party security. One small error, can result in huge consequences. Heck, even parsers will need updating as the complexity of algorithms and code increase. If these patches were tested properly, the AV manufacturers would have a chance to fix their products and get the fixes out before they clobber all of their customers. The “error” is not within Microsoft Update. It is the third party AV companies using undocumented techniques to worm their way inside the Windows 64-bit kernel without paying for a signing license. It is not up to Microsoft to test Windows for compatibility with third party software. That is the job of the third party developers. The only way a “testing” period would help here is if the patches were released to a specific group of Insiders who have each one of the third party security products assembled in every conceivable configuration. That would require an army. any links to back this up? Documented / Undocumented API – Why Should I care? The list over the years goes on and on, and includes how some third party antivirus programs were spying on users, and how some browser APIs were making users less secure, not more secure. So that’s the long form of why Microsoft has issues with third party software which uses undocumented APIs, and just what is meant by that term. There’s a long history of Microsoft Updates breaking programs which rely on undocumented APIs. The rest of the discussion rapidly gets in over my depth. But it is a long standing issue with third party antivirus, and has led to many Windows Updates issues. And other Windows issues. So yeah, Windows Updates (Feature Updates) can break Microsoft’s own Windows Defender antivirus. Thanks @rc-primak, I didn’t make the 2017 regkey connection. by these patches. It’s been third party AV’s who obviously have not complied with MS. Theoretically, W7 and MSE should be ok after patching although there has been no reports. Unfortunately, there are so many possible security configurations using third party products that I fear this may be impractical. Who knows which settings or combination of products will trip a trigger inside of Windows? We’re talking about the kernel here, so effects may be very difficult to trace, and then recommend remedies. All before a patch can go live. Microsoft works with dozens of AV vendors. A partial list is here. If all of the AV vendors are advised of needed changes, but a few of them don’t all fix their products in time… then what? Microsoft scrambles at the last minute to remove security fixes from Windows? And what if the AV vendor’s fix is faulty? Then what? We also generally have to accept that AV vendors are -never- going to go out of their way to say they made a mistake. Their business reputation depends on appearing to be competent. I just navigated here from Windows Secrets but for the life of me cannot find what used to be a “spreadsheets” forum … where is it now on this site? 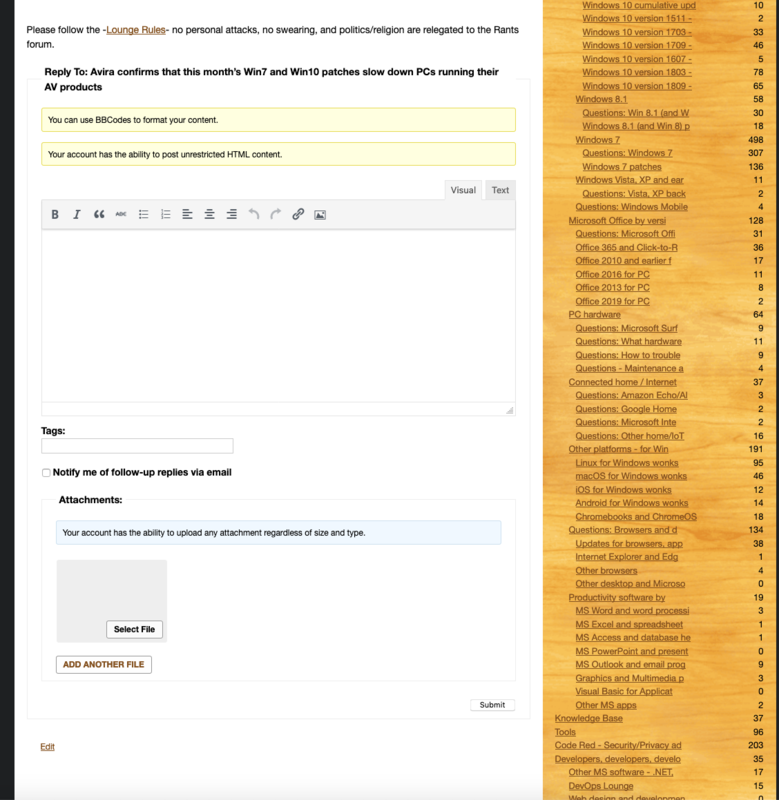 The “map” of the Forums is in the panel(woodgrain) on the right of the page at the bottom under “Forums.” See the spreadsheed Forum near the bottom of the screenshot. The topics are listed if you click on the link, or you can create your own topic at the bottom of the list. There’s also a hotlinked cross-reference on the Welcome! page. In this case, look down the left side and when you hit Spreadsheets, click the link on the right side. We haven’t yet started importing the Windows Secrets Topics (Questions) or Replies (Posts), but give us a few hours. In the interim, post away! Many of the VIPs you know from Windows Secrets are here to help. So how does this AV problem get fixed? If it turned out that one’s AV is playing up as reported some already are, what can a user do to ford this nasty mess and reach the other shore, there to keep going with his/her work, or to continue enjoying the favorite online fun activities in relative safety? Find another AV? How to tell an OK one from a bad one? Any ideas? Unfortunately, you just can’t tell a “good” AV from a “bad” one just by looking at it, or by considering its reputation. You might as well be trying to tell if a house has a slight crack in the foundation by looking at it using Google Maps. The quality of software is only as good as the people who are working on it at the time. AV companies, like all software firms, see people come and go over time. All it takes is one less experienced developer to overlook something subtle but critical, and *boom*, “Avira Antivirus update cripples millions of Windows PCs” (dated 2012). So….. do as we’ve always done: test before deploy. Thanks, Warrenrumak for that unsparing comment. But I’m afraid that, things as they are in my case, humble single-user on foot that I am, for me it has to be “deploy and test”. And if it’s no good, and if the machine still is in one piece and only slightly smoking, then uninstall and hope for better luck next time. For myself, who only has a single laptop that still runs Windows, by following details on ask woody I choose to observe while others do the testing, then deploy on the all clear signal. No stress, no smoldering chassis, no craters, no garments torn asunder. An inspired existence. Thanks Woody et al. Hmmm… That is also usually my approach to installing under dubious circumstances. But in this case there are so many AV products, each a potentially primed software hand grenade… the chances that someone else will get blown up when reaching for my particular brand of AV (and also that I’ll hear about it) are not really great. My calendar suggests there may be three more weeks of observation time available in my “testing” phase, where others are doing the testing. Should I still be trembling at that time, I will know that saving a new image of my current system, and disconnecting the drive that holds that image, before updating will allow me a straight forward path to recovery. There is a zen like calm in making preparations. Granted this is easier to achieve on stand alone systems like yours and mine. It gets a lot simpler (though not failsafe) when we’re only dealing with potential issues with one antivirus program. That would be Windows Defender. I do use scanners and even Cloud AV programs to supplement Windows Defender. This has provided plenty of protections for when I absolutely must use Windows online. But to be honest, I use Linux most of the time by far, especially for sensitive financial and health care online activities. For Linux I do scan with ClamAV. And the anti-Rootkit programs Chkrootkit and RKHunter. Command Line programs are not fun to run and collect logs, but they do allow a thorough investigation of anything suspicious which may be found. Realistically, Linux-specific infections are rare, but there’s always something to look at with Virus Total after even Linux scans. Windows scans with Windows AV scanners don’t provide nearly so much fun for me. But then, I do clean up after my web browsers, I have disabled Edge’s new run in the background and self-restart properties in the Group Policies, and I clean the system with CCleaner and Glary Utilities, following through with monthly runs of Disk Cleanup or Storage Sense. So there’s little left over to fuss with for the AV scanners. Just new updates and new user data mostly. Maybe the occasional stray adware PUP. So there is a place in my world for third party on-demand products and heuristics scanners. Just not their active shields. Those are what worm their way inside the 64-bit Windows kernel and can wreak havoc with updates and upgrades. If Microsoft had been doing any kind of testing, they would have been aware of the BSOD (in fact, they probably were). These are major AVs we’re talking about, on millions of PCs. They could have blocked the AVs and prevented the problems. In fact, back in the first quarter of 2018, they blocked ALL AVs unless the AVs put a value in the Registry. It may be the AVs are RESPONSIBLE for VIOLATING the security RULES. But it is Microsoft that is RESPONSIBLE for ALLOWING the CHAOS that affected millions of their customers. I get that it’s fun to use bold and caps and cast blame and all that…. But what’s Microsoft supposed to do if, say, only 95% of AV vendors update their software in a timely fashion? Is the security of the entire Windows ecosystem supposed to be put on hold because the dev lead for some AV product is on their honeymoon? And the PFY that tries to fix it in their stead cacks it all up? Nobody has a good answer to this. It’s a tough problem. Pretending it isn’t serves no useful purpose. PFY? BOFH? The Boss? Uncle Brian? Kudos to you, Sir! But, caps or not, I think PK is right: MS should have done something earlier and been a little more mindful of us poor Windows users, but waited instead until the last possible moment to unleash their reformist zeal. What is the actual outcome of absolving Microsoft of the blame, then. What do they do to recover from the problem, to be able to continue the operations necessary to business and personal needs. They don’t change AV products. They uninstall the update that was supposed to protect them from a vulnerability, so they can get back to business. They continue using the AV product that is violating the security rules (making them even more vulnerable) until the AV can be revised. They have neither the update nor a secure AV product. But they have a monumental amount of disruption. It seems Microsoft’s intention is to make it impossible to use any other security product but their own. Sorta reminds me of the Internet Explorer/Media Center thing. More likely, it is Microsoft’s intention to get the third party security vendors to obtain legitimate signed access inside the 64-bit Windows kernel, and to pay up for the privilege. As long as the piggy-bank gets filled, MS don’t care how they do it. Just don’t try to avoid paying and getting approval and then complain about MS Updates breaking your “backdoors”. Yeah, there’s something just not right in all this. I mean, in a case like this, was it a change in supported and documented behavior (a documented API or some such) or something that was supposed to be purely internal structures? Now it’s perfectly natural that an antimalware solution that scans on file access and such, will cause a performance penalty. That’s just basic math. How much of a performance penalty, that’s the good question. Then there’s the decision on what to do if the scan starts to take time. It’ll devolve into the “halting problem” eventually, but meanwhile – when do you abort the scanning process, do you fall back to allow or deny, and what’s this going to cause down the line then? The actual question still is, why wasn’t this tested, found and documented before public release? There are documented ways to gain direct access inside the Windows 64-bit kernel. But you do need to ask permission from Microsoft, and pay for and maintain a Signed Certificate. Seems that the update is also causing issues with McAfee. Installed this months update on several machines and it seems to block virus database updates. Uninstalled Aprils update and am able to receive McAfee database updates again. Any word on Kaspersky from “beta tester” victims? Two laptops at home, both running 1809 and the Kaspersky Free version. No problems with any current updates – fully patched. No issues at the office where we use Symantec Endpoint and Dell Threat Defense (re-branded Cylance). Two laptops at home, both running 1809 and the Kaspersky Free version. No problems with any current updates – fully patched. No issues at the office where we use Symantec Endpoint and Dell Threat Defense (re-branded Cylance). Do you have a link to a description? OK: I have a PC running Windows 7 Pro, x64 SP1, and am in no hurry to install this month’s Security Only update. Three weeks from now, or even longer, we’ll see. Maybe someone will try to use, before then, Webroot SecurityOnly, the brand of my AV, gets burned doing that, cries out in agony and so lets everyone know, before then. In case I missed it: is there anything that makes this particular Security Only update a “must install as soon as possible” one? I use MSE and Adwcleaner. No problems with them. Adwcleaner is not active antivirus. It’s a specialized on-demand scanner. It isn’t involved in these issues. Good thing this issue isn’t prevalent in all AV vendors. I’m not experiencing any issues with ESET AV. All good here, no speed issues after latest updates. When was the last time Woody told readers to take a full system backup before updating on Patch Tuesday? Just asking. Also, remember that for the current topic of discussion, the updating guide has not been written yet. Big Red MSDEFCON-1 and all that. It is easy and convenient to bash Microsoft and blame them for the problem. BUT, we do not know and probably never will know the true reason. Is it as RC Primak said above that the primary faiult lies with the AV vendors for using undocumented APIs? Is it Microsoft’s fault for introducing a new restriction in a valid API that was not documented and disseminated to the AV vendors? If the AV vendors are using undocumented APIs that is their fault. Any programmer worth their salt knows that an undocumented method can be changed or disabled at any time without notice. PK Cano posits that Microsoft should have caught this in testing and notified the vendors. Maybe they did. They may have notified the vendors and the vendors ignored it. Microsoft may not have given the vendors enough time to rectify the situation. The AV vendors are never going to admit fault for that would potentially damage their reuptation(s). It is always easier to blame Microsoft. Maybe Microsoft did not catch it. We do not know if this is a general condition for all Avira (and other 3rd party AV) users or if it affects a certain configuration(s) only. There is no way Microsoft can test all the hardware and software configurations. I’m sure they run an automated test suite over hundreds and probably thousands of machines. But that is a mere drop in the bucket of the configrations that can exist. So now that we know all this, what do we do? What should Microsoft do? This is actually a very simple issue. Microsoft issued a bad patch. As the issuer of said patch they need to step up and take responsibility for it and get it fixed. If an AV vendor had issued a bad patch, then that vendor would need to step up and take responsibility for it and get it fixed. If I was an executive at MS I would want to prevent this sort of thing from happening again. In order to do that I would need to know if it was my guy(s) or the other vendor’s guy(s) who made the mistake(s) (realizing that it could well have been a combination of my and their guy(s) who are at fault). But as a customer, I don’t really care about who’s to blame. What I see is that I’m using an MS operating system and applying an MS patch that bricks my computer. Microsoft, you need to get it fixed! Now! Microsoft and ArcaBit have identified an issue on devices with ArcaBit antivirus software installed that may cause the system to freeze or hang upon restart after installing this update. Arkabit is a Polish antivirus program. And this particular report doesn’t sound like the slow-as-sludge reports I’ve seen. I bet we have another shoe yet to drop. Please forgive my ignorance but this is a bit mind-boggling for civilians. Does this problem currently affect all versions of Avast (e.g. free) with all versions of Windows 10? Avira and Sophos are blocked on Win7/8.1, Avast has issued an Emergency Update, and MS is investigating ArcaBib. I don’t see anything on the Win10 1803 page. I’ve installed the KB4493509 update on my win10 v1809 machine that has just windows defender & Malwarebytes free edition and I am not experiencing any problems with that update. maybe it happens with just Malwarebytes Premium and not the free version. Conjecture: While we debate the blame for allowing or misusing API’s, I notice that there does not seem to be a consistent pattern in the wilderness*. I propose that in addition to the known actors, Microsoft’s OS and many vendor’s security products, there are the unknown actors and their malware. Is it possible that the common element is an agent that afflicts systems only when infected? Doesn’t even have to be blackhat, could be a normally benign agent that is not accounted for in “testing”. * I do note there have been large networks that show 100%, or nearly so, rates. Those are also likely to have consistent profiles and cross contamination anyway. This is possible, but in my less than expert opinion, doubtful at present. Anyway, such a roundabout explanation seems to me to be premature and unnecessary. It violates Occam’s Razor (the simplest explanation is often the correct one).